Have you ever made a poor financial decision because you got caught up in the moment? I have. I once bought a car when I was caught up in the moment. I paid full price (plus more). I financed the car 105% – I even financed the sales tax! 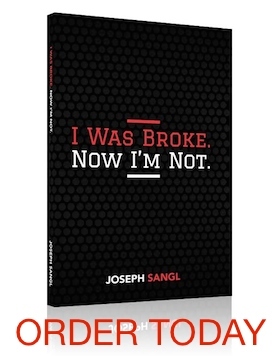 That decision helped me write the “I Was Broke” part of my book I Was Broke. Now I’m Not.! If you are just getting started on your Debt Freedom March, I want you to pay attention to another form of impulsiveness that can keep you broke – the impulsive desire to become debt-free. Let me explain. I see people who take our classes or participate in the I Was Broke. Now I’m Not. Group Study who catch a vision of what life would be like with a written life plan, a written spending plan, and free of debt. They understand the freedom that this delivers, so they want it NOW! It is so inspiring! So exciting! So motivating! Yet, I have seen this impulsive desire to become debt-free become financially harmful. How has it become harmful? Here are some common ways I see people (who have great intentions) hurt themselves financially because they want to become debt-free NOW! Cash in the 401(k) I have seen countless examples where people cash in the 401(k) to pay off credit cards or other debts. There are two problems with this. (1) They ROB themselves of their retirement savings! and (2) There is a tremendous cost – taxes PLUS a 10% federal tax penalty if the person withdraws it before turning 59-1/2 years old. It usually means that 40% or more of the 401(k) ends up leaving to the government! Cash in the whole life insurance policy I have seen people cash in a whole life insurance policy and NOT have other life insurance in place (I own 30-year level term life insurance). There are two problems with this. (1) Without another life insurance policy in place, there is a gap in coverage. Gaps are terrible. (2) The immediate debt problem is addressed, but if the individual does not address the behavior that led to the debt in the first place, they will usually end up right back in debt. Only now they will not have the cash value built up to bail them out. Apply all of the tax refund to debt pay-off The first step toward financial health is to have at least $1,000 in an emergency fund ($2,500 if you have kids or a house). Too many times I see individuals become consumed with becoming debt-free and they fail to save money. As a result, they might pay off more debt at the beginning, but something will happen like a car breakdown or appliance failure. Without any savings, the individual will have to turn to debt again. Make sure that you save money FIRST. Financial impulsiveness rarely works out favorably. This post could not have come at a better time for me. I plan to be debt free by the end of the year, however, there was a piece of that that plan that would have me using my emergency fund to to that by Christmas. I will now rethink that. Looks like I’m headed for Feb. or Mar. before I meet my goal, but it’s OK, Thanks for this post. Wise words indeed. Thanks so much for posting!